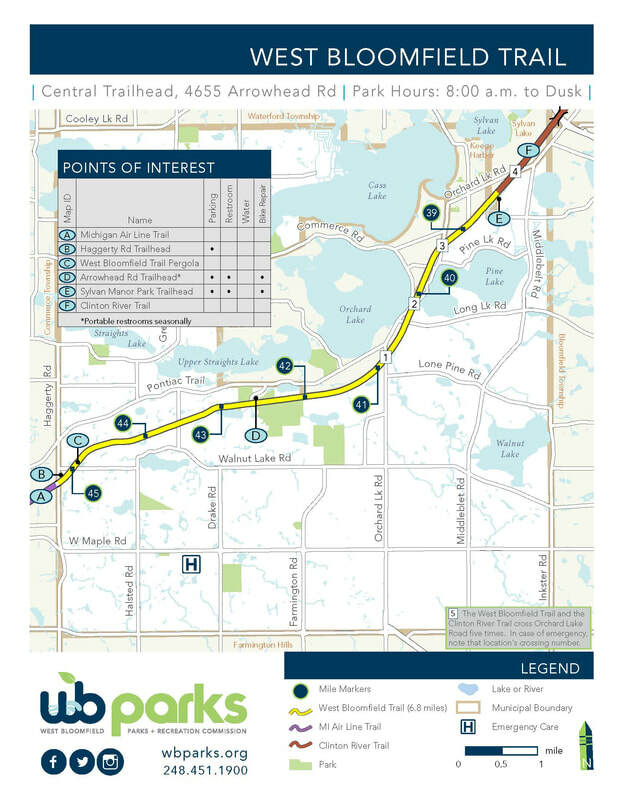 The West Bloomfield Trail is a 64 acre linear park that meanders for 6.8 miles through West Bloomfield, Orchard Lake, Keego Harbor and Sylvan Lake. The trail extends from Sylvan Manor Park in the east to Haggerty Road in the west. This former railroad corridor has been purchased and developed over the years with the assistance of grants from the Michigan DNR and the Michigan DOT. The West Bloomfield Trail is part of a larger network of trail systems that are planned to go from Lake Michigan to Lake Huron. The ITC Walking program is a free, fun and pleasurable walking activity designed to promote an active lifestyle while enjoying West Bloomfield's parks. Summer walks are scheduled from May to July at various locations throughout West Bloomfield and range from 1.5 to 3.5 miles in length. All walks are open to the public and free of charge. Tuesday walks begin at 7:00 pm and Saturday walks begin at 8:30 am. Drawings for door prices will be held after each walk. Fall walks are led by volunteers from the end of July to October at various locations throughout West Bloomfield and range from 1.5 to 3.5 miles in length.